All of the code used is available after the video below. 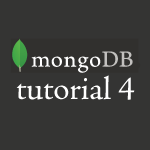 If you missed previous tutorials, you should watch my first MongoDB tutorial to start. 1. Map/Reduce allows you to split a large problem into smaller parts. smaller aggregation of key / value pairs. 2. Why is Map useful? 4. Map is called for every document in the collection. Map sends the total student name list to reduce. 5. Reduce is called by map and receives all the values for the given key. Then we add how many times the student name shows up in the collection of documents.